The victim of the first ISIS-claimed terrorist attack on U.S. soil is now suing the FBI for encouraging, directing and aiding the suspects. While questions remain as to whether the Federal Bureau of Investigation had prior knowledge of the Las Vegas shooting, the victim of another terrorist attack on United States soil is speaking out, and attempting to hold the FBI accountable for the suffering he endured. In May 2015, two men opened fire outside of a provocative “Draw Muhammad” event in Garland, Texas. While the suspects were ultimately the only casualties, the attack is notable in that it became the first ISIS-claimed attack on American soil. It is also notable, because of the close proximity between an FBI agent and one of the suspects—both before and during the attack. Simpson gained the FBI’s attention a few years before the attack, as a Muslim who they saw as vulnerable to radicalization. In fact, FBI agents were reportedly monitoring him in the weeks leading up to the attack, and there was even an agent in a car following him to the scene, who did nothing to prevent the crime. 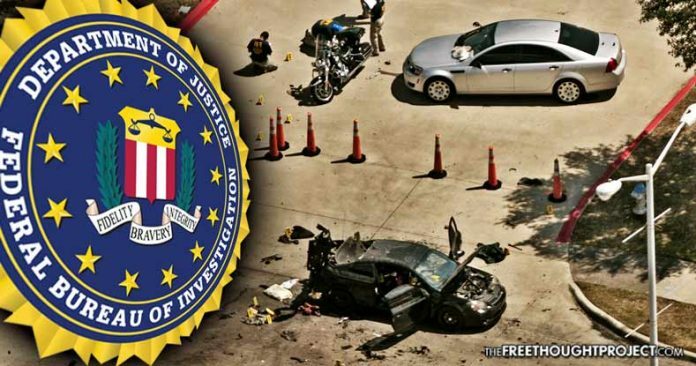 According to a report from CBS News, court records revealed that the FBI agent who was in the car directly behind Simpson and Soofi during the attack had “texted Simpson just weeks before with the message, ‘Tear up Texas,’” and he was even “taking pictures of the car about 30 seconds before the first shots were fired.” As soon as the suspects opened fire, the agent fled the scene. As The Free Thought Project reported, both local law enforcement and the FBI did not respond to warnings from a woman connected to Anonymous, who cautioned that there was going to be an ISIS-inspired attack at the event—just days before it happened. “The FBI helped the terrorists obtain a weapon that was used in the attack by lifting a hold during a background check, incited the terrorist to attack the Garland event, and even sent an agent to accompany the terrorists as they carried out the attack,” the lawsuit states, according to a report from the Washington Examiner. The issues alleged in the lawsuit could be explosive if the FBI is forced to acknowledge and respond. In addition to the accusation that the Bureau’s agents encouraged and directed the attack, the claim that the agents lifted a hold during a background check, in order to help Simpson and Soofi obtain the firearms used in the attack, is incredibly important. It is a reminder that even if gun control measures requiring strict background checks become law, the FBI has the power to bypass them, in order to serve their agenda. As WikiLeaks founder Julian Assange recently noted, “Almost all ‘terror’ plots are created by the FBI as part of its business model.” While his comments were in reference to the Las Vegas shooting, the underlying principle applies to a number of both foiled and deadly attacks.